President Muhammadu Buhari, ex-Head of State Gen. Yakubu Gowon (retd), and the General Superintendent of the Deeper Life Bible Church, Pastor W.F. Kumuyi, have counselled Nigerians to pray for the nation in order to have peace and prosperity restored. The trio spoke variously during a church service on Sunday at DLBC headquarters at Gbagada, Lagos. The event, which had in attendance church leaders, high ranking government officials and others, was tagged Special National Prayer Service. In his speech at the well attended event, the convener of Nigeria Prays Movement, retired Gen. Gowon, said that Nigeria’s problems would be resolved through unrelenting prayers by the Church, rather than by citizens resorting to violence, retaliation and unforgiveness. The News Agency of Nigeria reports that the annual event brings together Christian faithful from various denominations as well as political office holders. Gowon, who took his reading from 2 Chronicles 7:14, urged the congregation to pray for the nation, saying that God is interested in the Nigerian situation at all times. “The Church must provide a moral compass for the nation to make the people imbibe the fear of God and to follow righteousness. “Brethren, it is important to remind us that the church is God’s House of Prayer. With the general elections coming ahead, it is natural for people to become anxious and fearful of what the future holds for Nigeria. “In the light of the wanton killings in the land – be it politically motivated or instigated by the dark agents of insurgency like Boko Haram, armed herdsmen or rustlers, there is great need for us to come together to pray and intercede for our dear nation and its people. “God’s solutions to the problems of this country is not in guns, retaliation or physical weapons but in prevailing prayers of the church. According to him , citizens of this hold important role of maintaining peace and unity for the progress and prosperity of Nigeria. He cautioned Christians against reprisal attacks, retaliation, vengeance and religious intolerance in the guise of self- defence. Gowon said that the mission of Nigeria Prays was to mobilise all Nigerians to offer prayers for the healing and transformation of the nation. The general commended the host minister, Pastor William Kumuyi, for his love and commitment to nation growth and development. In a message, President Muhammadu Buhari also commended Gowon and Kumuyi for their passionate love for national cohesion. 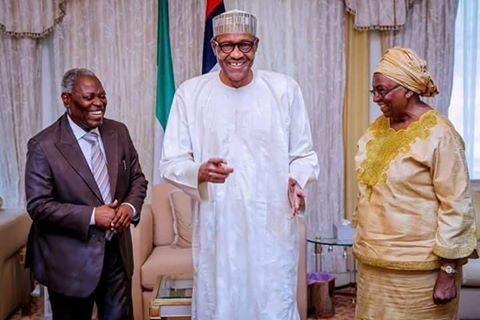 Buhari, whose message was read by his media aide, Mr. Femi Adesina, said that love and commitment of Gowon and Kumuyi to the unity and cohesion of the country were unparalleled. Also speaking, Kumuyi, who spoke on “Divine Assurance When Nigerian Prays’’ said that God will answer if His people, faced with national perplexity, could pray. “Nigeria won’t disintegrate, we are just starting,’’ he assured his listeners in the live broadcast that was related globally. According to him, if God could turn around and show mercy to Nineveh, Egypt, Assyria and other countries as well as various individuals like Rahab in the Bible days, there is hope for Nigeria.